Asiatic Jasmine – Trachelospermum asiaticum (6 – 12 inches) Sun, part sun, or shade. Glossy green evergreen leaves about nickel-sized. Spreads rapidly by long, trailing runners. Plant as early in growing season as possible, since much of plants’ growth occurs in spring. Needs to be pruned in late winter. Carpet Bugle – Ajuga reptans (3 inches) A good evergreen groundcover for a shaded area although it can take sun if it receives adequate moisture. Leaves mostly basal, dark green. Flowers are irregular and 2-lipped, in close clusters or spikes, blooming in spring or early summer. Japanese Purple Honeysuckle – Lonicera japonica ‘Purpurea’ (12 – 24 inches) Sun or part sun. Dark green foliage with purplish cast. Foliage turns more purple in winter. Fragrant spring flowers white with purplish-red tint. Prune severely in late winter, as needed to reduce overall height when plants become lanky. Mondo Grass – Ophiopogon japonicus (9 inches) A good sod-forming ground cover. Leaves dark green, 8 – 16 in. long, arising from under ground stolons, the roots bearing small tubers. Flowers are light lilac, 1/4 in. long. Fruit pea-size, blue. Grows best in sun or shade. Mow planting in late winter, before growth begins, to remove foliage damaged by cold. Dwarf Mondo Grass is similar but only 3 in. high with no flowers or berries. A nice groundcover between flagstone. Grows well in shade. Will sun scorch. Periwinkle – Vinca major (18 inches) An evergreen groundcover that makes a thick carpet of trailing stems. Leaves are heart-shaped at base, dark green. New growth in spring is intensely bright green. Flowers are blue, 1 – 2 in. wide. Should be mowed down in late winter. Partial shade to shade. 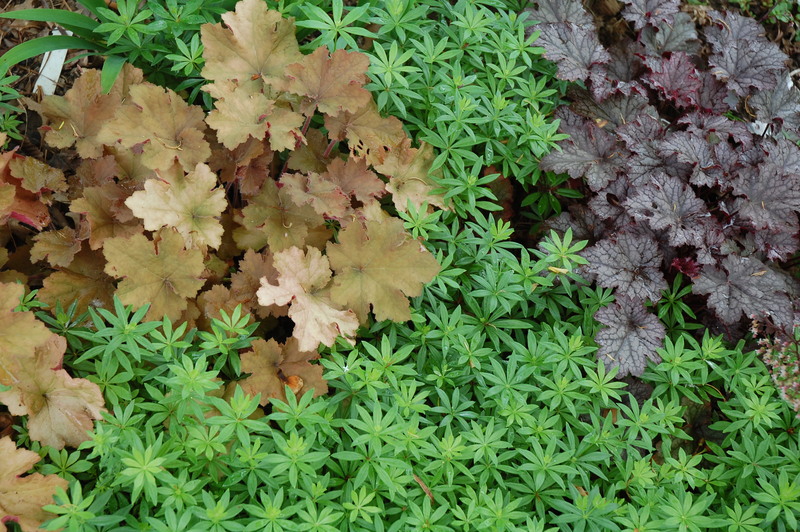 Ground cover provides options for color and texture.